With the resources of Earth becoming a problem, humanity began preparing Mars as a suitable replacement. However after terraforming the planet for five hundred years, humanity returned to Mars to find that their plans had gone horribly awry as the cockroaches sent to the planet to help with the terraforming process had evolved into towering killing machines. After two failed attempts at reclaiming Mars, a new expedition has been sent to Mars with a new goal, but before they even land on the planet, it is clear this new mission is in trouble. Whereas the second volume of Terra Formars was spent explaining to readers that a new virus, the A.E. Virus brought back from Mars, has begun sweeping the planet with a 100% mortality rate, going over the plans for Annex 1 and introducing us to some of the new members of the crew, Terra Formars Volume 3 throws readers right into the middle of the chaos. In the closing pages of the second volume cockroaches had somehow managed to make it aboard Annex 1 and have begun slaughtering the unprepared crew only for things to grow even more dire when the cockroaches, with knowledge that they shouldn’t possess, destroy the drug that allows the crew to transform. Forced to continue with the mission, Shokichi Komachi orders the crew to split into six different squads, each led by an officer, and escape the doomed vessel with escape pods. Little do they know that while humanity has spent the last twenty years researching and developing new techniques in order to face off against the cockroaches, their foes are far from mindless. With a crashed base of operations, a crew split into six separate squads, a minimal supply of the drug used to fight the cockroaches, and a new type of foe that they are unprepared for; the crew of Annex 1 begins their desperate fight for survival. 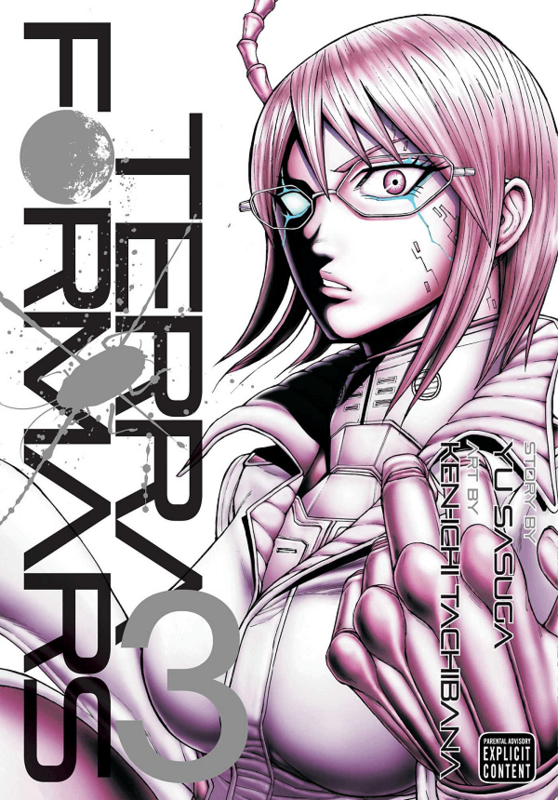 Unlike the second volume, which was slow paced and featured little action, Terra Formars Volume 3 moves the story forward at a fast pace by weaving explanation and action together in a manner similar to what was present in the first volume. It quickly becomes clear that despite the Annex 1 project being organized by the United Nations, a traitor with other goals is either amongst the crew or had a hand in planning the mission. While this is an interesting twist that does help explain certain strange events, it also feels like the series is getting a bit sidetracked, especially since there is already such an uncaring and deadly foe waiting on Mars. By forcing the crew to split into six different groups and forcing them to conserve the transformative drug, the stakes are raised even higher when it comes to fighting against the cockroaches in this volume and it definitely shows. Over half of the volume features the crew fighting against the cockroaches using their genetically modified bodies, but don’t let that fool you as the body count rapidly rises as background characters are brutally killed one after another. Even characters that have seen a bit of development fall to the nearly invincible cockroaches who have managed to acquire some new techniques. These deaths hit home harder thanks to the fact that readers have been able to learn about the cast at least a little at this point and even if there is no time to mourn on the battlefield, these moments will certainly pull on the heartstrings of the reader. As I mentioned, the return of information laced in with the action returns in this volume as the little facts about the insects that characters have been augmented with reappears as the new characters reveal their abilities and even information pertaining to the secret behind the now outdated BUGS transformation is revealed. Being printed under Viz’s Signature label means that Terra Formars Volume 3 is slightly larger than your average manga and it continues to benefit from these larger pages, especially now that the focus has shifted back towards the unique battles. The amount of detail put into the various metamorphoses that occur as the characters make use of their creature they have been altered with is very impressive, especially when stages of the transformation are shown on a certain special member of the crew. It is also worth noting that since the action has returned, it also means that the blood and gore has as well and it is stronger than ever. Characters will be swiftly decapitated or lose limbs with a large amount of detail put into the gore of the body and even the deaths of the cockroaches have grown even more brutal thanks to some of the unrevealed abilities of the officer class. There are three bonus pages spread throughout Terra Formars Volume 3 featuring detailed information about two members of the cast on each page. This information includes their procedure base, if it has already been revealed, age, likes and dislikes, as well as a brief summary of their personality and past, though for the female cast it will also include their cup size. At the end of the volume a four page “unreleased layout” featuring very rough artwork is included and is described as something that was cut out of the chapter. This miniature story likely would have been an extended flashback and it is understandable why it was cut due to it not really adding anything extra that hadn’t already been focused on. Terra Formars Volume 3 raises far more questions than it answers as the crew of Annex 1 struggles to survive against cockroaches that are stronger and smarter than they were prepared for. With Yu Sasuga managing to once again find a satisfying balance between information and action, this volume manages to find what made the first volume so great. There are a few concerning elements raised in this volume about where the focus of the story may shift but for now the series continues to progress down a gory path that readers can’t help but continue walking down.